Contact person: Dr. Per Knutsson, Director of studies for Human Ecology, phone: +46 (0)31 786 42 14. Personal web page. The department moved location in late August 2005, to Campus Linné, and its three imposing old buildings – Annedalseminariet (Övre Husargatan 34), KK 2 (Konstepedimins väg 2), and Rektorsvillan (Seminariegatan 1). It is jointly administered within the framework of the new School of Global Studies at Gothenburg University (SGSGU), and part of an effort to coordinate global studies across disciplinary and regional limitations. Dr. Per Knutsson was the Coordinator for the ”Case-study Course on Sustainable Development” programme, jointly run by Göteborg University and Chalmers University of Technology. Besides, Per teaches at the course on Environmental and Social Change in Asia, organised by the Centre for Asian Studies, CEAS, within the School of Global Studies. Per Knutsson defended his doctoral dissertation, entitled ”Interdisciplinary knowledge integration and the Sustainable Livelihoods Approach. Case Studies on rural livelihoods in Kenya and China” (not focusing on South Asia) in December 2005. However, initially the project was entitled ”Forest based CDM projects in India – impact assessments of present regulation and analysis of the prospect for establishment of forest based CDM projects in southern India”. The project was funded by the Swedish Energy Agency and carried out in collaboration with Physical Resource Theory, Chalmers/GU, Centre for Ecological Sciences at the Indian Institute of Science in Bangalore, India and the Joint Program on the Science and Policy of Global Change, MIT, USA. He was supervised by Madelene Ostwald from Physical Geography, Dept. of Earth Sciences, and at the conference on ”Structures of Vulnerability” held at Stockholm University in January 2005 they presented a paper together, called ”A dynamic and process-oriented Sustainable Livelihoods Approach – a tool for increased understanding of vulnerability, adaptation and resilience”. Read an abstract of the thesis. Alin Kadfak is a PhD student at Human Ecology (soon will change to Environmental Social Science) at School of Global studies, University of Gothenburg from September 2012. Gunilla Olsson and Per Knutsson are her supervisors. The research project focuses on socio-ecological change in marine and coastal ecosystem in developing countries, and the Indian west coast is the area for case studies. She is involved in a research project jointly organised by the Department of Biological and Environmental Sciences, University of Gothenburg, and the Fisheries College in Mangalore. More information. Since graduating from Chulalongkorn University, Thailand in 2004, Alin Kadfak has worked with a number of development projects and organizations. She started as a field officer at Adventist Disaster Relief Organization (ADRA) focusing on vocational and economic development in communities along the Andaman coast during the post-tsunami period. She continued with Kenan Institution Asia as a coordinator, implementing workshops for product development, microfinance and entrepreneurship. Later, Alin took a position at Goodwill Group Foundation as a vocational training manager. This work focused on improving lives of disadvantaged women in Bangkok through career coaching, job placement and vocational training. More recently, Alin graduated with a master’s degree in Sustainable Development from Uppsala University in Sweden. Her thesis focused on social relations of different stakeholders in waste management in semi-urban setting of Eastern Ghana. Between 2012 and 2014, Andrea Nightingale (photo) was an Associate Professor at the School of Global Studies. She was previously the Director of the MSc in Environment and Development and a Senior Lecturer in Environmental Geography at the University of Edinburgh (2002-2012). Her PhD from the University of Minnesota in Geography was based on work done in Nepal since 1987 on questions of development, natural resource management, community forestry, gender, social inequalities and governance. Andrea is now (2015) Professor at the Division of Rural Development, Dept. of Urban and Rural Development; Swedish University of Agricultural Sciences (SLU), Uppsala. Her academic interests include pioneering work on socio-natures, critical development studies, and methodological work on mixing methods across the social and natural sciences. She is presently involved in a collaborative research programme with the University of Toronto and ForestAction Nepal investigating democratic governance in the post-conflict state. She has worked closely with the Nepal-Swiss and the DFID-funded Livelihoods and Forestry Programme (both community forestry projects) in Nepal on their land management programmes, gender and equity programmes and climate change strategies. She has also worked in India, Indonesia and South America during the course of her studies and short term consultancies. Presently her theoretical interests incorporate feminist work on emotion and subjectivity with theories of development, authority, collective action and cooperation in common property situations. Her most recent theoretical and empirical work seeks examine the confluence of climate change and violent conflict. Andrea held a highly interesting SASNET/UPF lecture on ”‘Naya’ Nepal? The practices and challenges of local democracy in the Federal Republic of Nepal” in Lund on November 21, 2012. The seminar was jointly organised by SASNET and the Association of Foreign Affairs at Lund University (UPF). More information. While still being PhD candidates, Per Knutsson and his colleague Ylva Engwall worked with a joint research project on ”Deconstructing the Sustainable Livelihoods Approach”. They presented the project at the Development studies research conference at Lund University in January 2003. Read an abstract. Ylva Engwall has later worked in the European research project ”A cognitive approach to rural sustainable development – the dynamics of expert and lay knowledge (CORASON)”. The project uses, through case studies in 12 different European countries, the study of changes towards sustainable development in rural Europe as a means of illuminating the shape and dynamics of European knowledge society more generally. 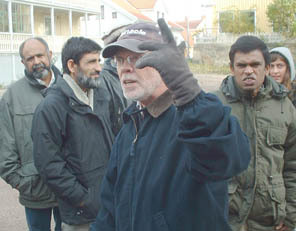 Professor Emeritus Hans Egnéus has worked with projects related to South Asia for a large part of his career. He has been connected to Swedegroup, a consultancy agency engaged in analysis of economic, financial and social issues of development projects and programmes in the Third World and in Eastern Europe. In 2003, he was working with the Dungarpur Integrated Wasteland Development Project in Rajasthan, India. In recent years, he has been engaged in the interdisciplinary research programme Environment, Culture and Development, based at Museion, University of Gothenburg. This is a research programme with the aim to establish new knowledge through a transdisciplinary co-operation of researchers, which includes seminars, workshops, conferences, courses and other activities. Personal web page.